Bangkok, Thailand. My first ever professional shave. I lay back with my eyes closed, afraid to open them. The shaver knows all the angles and pulls at my skin to get the closest cut. I think about the only times I’ve seen a man shaved by another man, in the movies. Many of those scenes end with a slit throat and blood pooling at the base of the chair. Eastern Promises, Boardwalk Empire, Sweeney Todd — I realize I am gripped tightly to the arms of the chair. Sihanoukville, Cambodia. I find a stable-looking shack with one chair and an angry-looking barber. Perhaps he is frustrated with his work. Or maybe the beach, which is only 20 metres away, is taunting him. Or maybe he doesn’t like me. I try to think of reasons why he might hate me as he pulls a shiny, sharp razor blade out of its package. He’s probably just jealous of my height. My legs dangle over the sides of the chair; with not enough room to stretch them out in front of me. As the blade touches down and I listen to it scrape across my skin, I decide it’s best to think about something else and I go to my happy place; on my couch, in front of the TV, eating a big bowl of cereal, and watching Simpson’s reruns. The shave is relaxing and thrilling at the same time. Perhaps like getting a massage on a roller coaster. Savannakhet, Laos. Fully calm, I float on a bed of shaving cream as the razor skates around my neck. My mind wanders to peaceful thoughts only. My heart rate is low, and my body is loose. I am really enjoying this. It isn’t until he cleans me up that I realize that I have been cut. Nha Trang, Vietnam. I should keep walking but it’s 35 degrees out and I am tasting sweat as it runs down my face and into my panting mouth. The young girl at the beauty salon rushes me into a chair and smothers my face in shaving cream. She is maybe 20-years-old. An older, probably more experienced, lady sits in the corner giving orders to the girl, who desperately searches for the blades. She tries calling someone on her cell phone but doesn’t get through. Finally, she yells out and an even younger girl comes out from the back room. She is sent to the store to buy razor blades while I lay in the chair feeling the tingles of the shaving cream on my face. Puerto Princesa, Philippines. The chair doesn’t recline so I sit staring at a poster of a pre-pubescent Aaron Carter with a giant iguana on his shoulder. The young man with the blade is smoking a cigarette, looking a little too rock and roll to be dragging a blade around my neck. He pulls out a squirt bottle and sprays me in the face. A game show that is on the TV is playing the theme to Benny Hill. This is not looking good. After spreading the water around with his fingers, he starts taking chunks of hair off my face. No cream, no soap, no powder, just water. Ten seconds in and I am bleeding. The barber wipes the blood away with his fingers. I am surprised when he doesn’t wipe it on his face and growl, “It begins!” He reaches for some alcohol and I consider doing the Home Alone thing when he slaps it on me, but instead I cringe as it stings my blood-filled cuts. Sandakan, Malaysia. Placing my flip-flopped feet down carefully in order to dodge the multiple hair piles, I make my way to the barber chair. 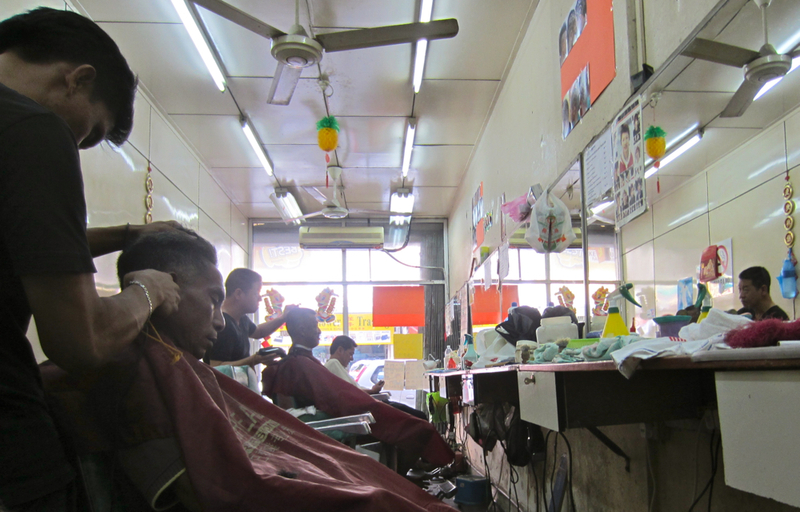 This is probably the most complete barber shop I have been to in Southeast Asia. I sit and watch another man being shaved. Shaving cream, a recline to the chair, a wet cloth at the end of it all — I was excited to feel the blade across my face again. Then a guy appears and lazily walks up to me. His face is clean-shaven except for one spot where about fifteen straggly hairs slither all the way down to his shirt. It’s like he had missed a spot shaving… for the past ten years. I close my eyes as he covers half my face with cream. I feel him walk to his station and return, presumably with a new brush-load of cream. Nope. The razor touches my skin and starts slicing down the hairs. As he hacks at me, I realize that there was no way he had time to put a new blade into the handle. I can suddenly feel the dullness of the razor. Visions of AIDS dance through my head. I picture myself bald and frail like a scene out of Philadelphia. “We’re standing here in Philadelphia, the city of brotherly love, the birthplace of freedom, where the founding fathers authored the Declaration of Independence” — AAAAND CUT! I feel a tingle in my skin. The man rubs at the wound.